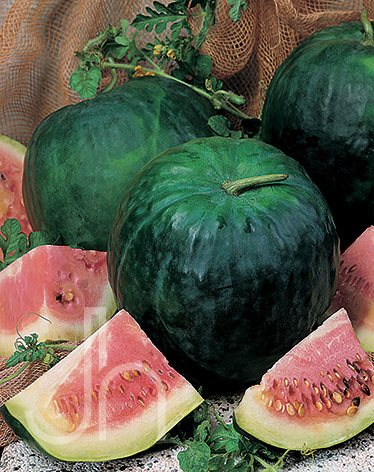 Black Diamond Watermelons average 35 to 50 pounds but can get much larger! The rind is tough and deep black in color while the flesh is bright red, sweet, crisp and juicy. Tips: Plant two plants every 48″ to ensure a successful crop. Placing a straw matt under the watermelon will prevent the bottom of the watermelon from rotting as it continues to grow. Fertilize well by side-dressing the rows with nitrogen whe n vines begin to run and keep the soil moist at all times. Click here to buy Black Diamond direct from www.buygardenvegetables.com.